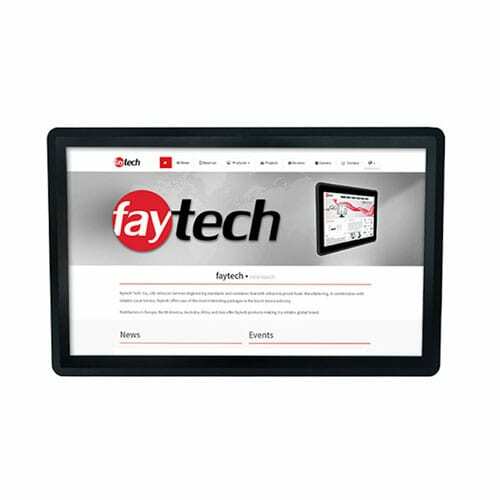 faytech North America manufactures capacitive touchscreen displays ranging from 7 inches to 55 inches. Below you can see all of our monitors available at the moment. If you have any questions or would like recommendations, contact us today and our specialists will be glad to help. 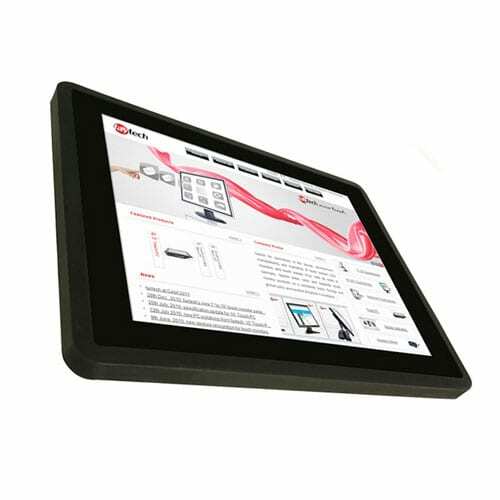 A capacitive touch screen monitor is a device that allows input and output. 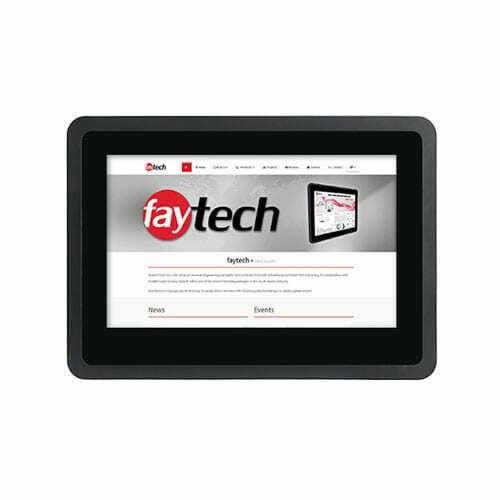 By using fingers or a special stylus pen for touching the screen, users can control the information processing system or input data through multi-touch or simple gestures.faytech capacitive touch monitors consist of a projected capacitive touch panel with 7H hardness front glass optically bonded to a liquid crystal display, complete with driver electronics and IP65 housing. 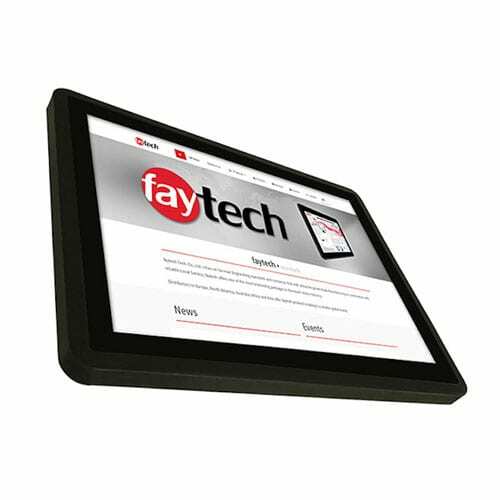 All faytech monitors support VESA standard mounting, and monitors in the 13.3”-21.5” range additionally come with desktop stands. While great for applications where the user is required to push a few buttons, capacitive touch monitors truly excel in more complex scenarios, like maps or directories with zoom and panning functions. Recent technology advances also allow these monitors to work even in situations where the user is wearing heavy gloves outdoors in heavy rain. The advantage of this technology is that it enables users to directly react to and interact with the data displayed, instead of employing an intermediary device such as a touchpad or mouse. This can save valuable desk space and allow for creativity in where to locate touch monitors. Touch interfaces enable easy integration with computers, which enable useful metric tracking for measuring traffic or logging entered data. Due to the popularity of smart phones, customers are typically very comfortable interacting with touch monitors, and can even be attracted to them. Touch monitors are commonly used in numerous public-facing applications such as electronic voting machines, game consoles, smartphones, tablets, personal computers, automobiles, advertising kiosks, and kitchen appliances. Touch interfaces are also heavily used in industry applications. They are found in the medical field, ATMs (automated teller machines), museum displays, automated equipment controls, and avionics systems. 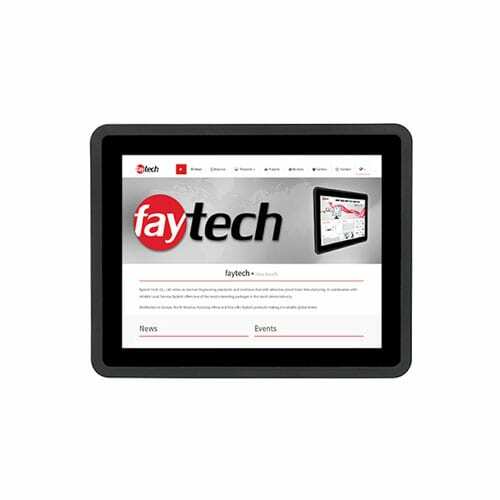 faytech North America is the New York distribution center for all faytech products. 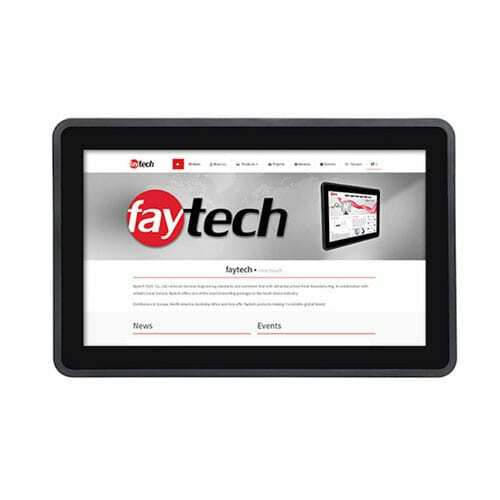 faytech NA specializes in the design, development, manufacturing, and marketing of specific computing solutions such as Touchscreen Desktops and Displays for Capacitive, Embedded, Industrial, Resistive, Rugged, Sunlight Readable, High Brightness, Open Frame, Kiosks and Accessories. 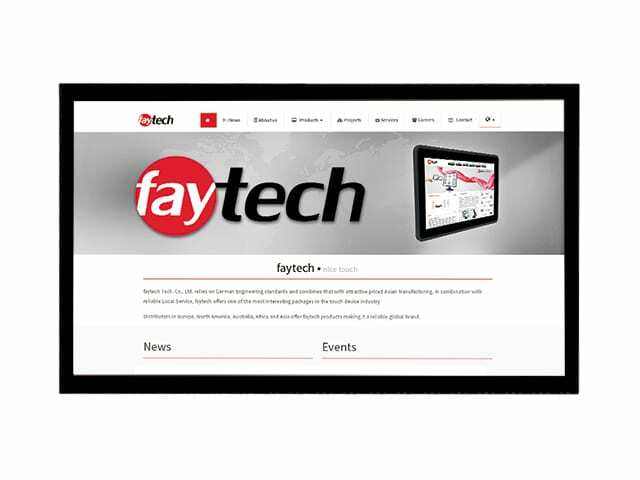 faytech NA also customizes projects for our clients throughout North America, South America, Europe, Africa, and Asia. 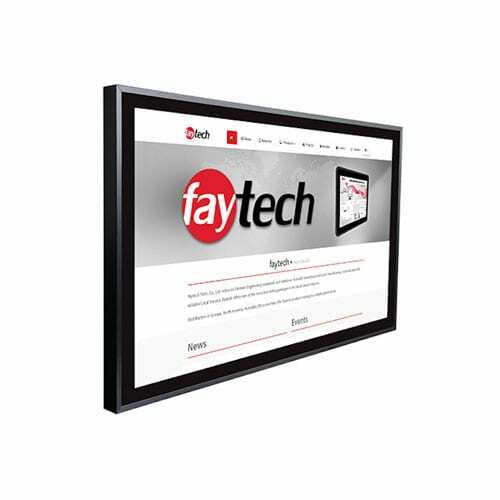 faytech NA currently manufactures 7–22” Monitors, 8–19” PCs, and the 32–42–55” PC LFT Series. Additionally, we have developed our own proprietary PC motherboard, which is manufactured exclusively by ASUS. Whether it is finding the ideal product for your business, to the installation of the products or to technical support, our entire team works hard to always provide our customers with the best products and service on the market. 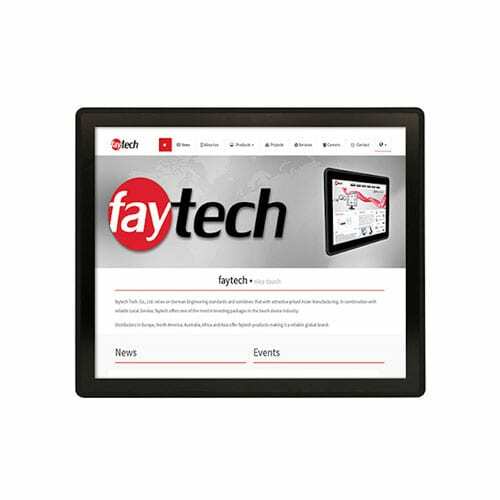 At faytech North America, we guarantee customer satisfaction. Our staff is fully trained and knowledgeable about every product we offer, ready to assist you with whatever information is needed. 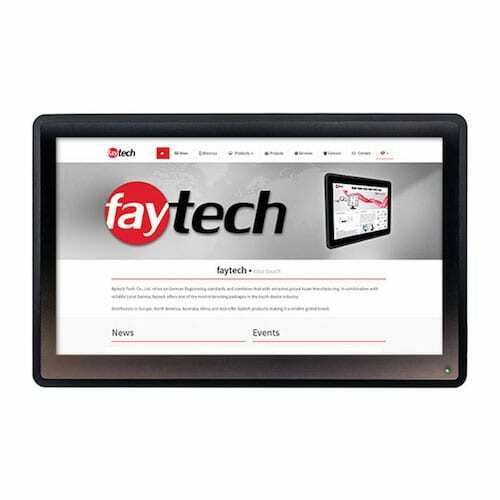 Feel free to contact us at any time with any questions, or to learn more about a faytech NA high-quality display solutions for your unique company. Thanks to the accurate touch sensors, capacitive touch screen monitors are implemented as a viable solution for situations where the mouse and keyboard systems cannot be used as suitably accurate, rapid, or intuitive means of interaction with the content on the screen. The touch controller-based firmware and touch sensor have been made available, historically, by a various after-market system integrators, and not by the motherboard, chip, and display manufacturers. However, chip and touchscreen manufacturers worldwide have acknowledged in the last few years the trend toward a wide acceptance of touch-friendly interface components as a highly desirable alternative and have begun to integrate this technology into the design of their products. A touch screen can be used practically anywhere. One of their greatest advantages is the fact that they are very easy to use. A capacitive touch screen monitor can be used similar to a keyboard that is invisible since it displays only as many button choices and as much data as users need to complete a particular task. This is one of the reasons why these devices are increasing in popularity in various applications from industrial machinery to kiosks and mobile phones. 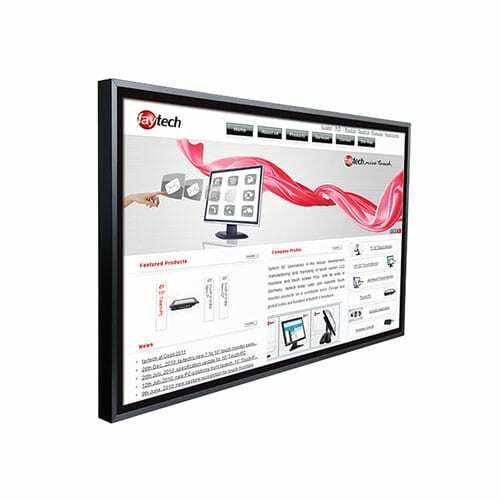 In selecting the most suitable monitor for your application, the most important decision is in regard to the type of touch screen technology to use. It comes in several types based on a few different technologies, each with its own advantages and disadvantages. 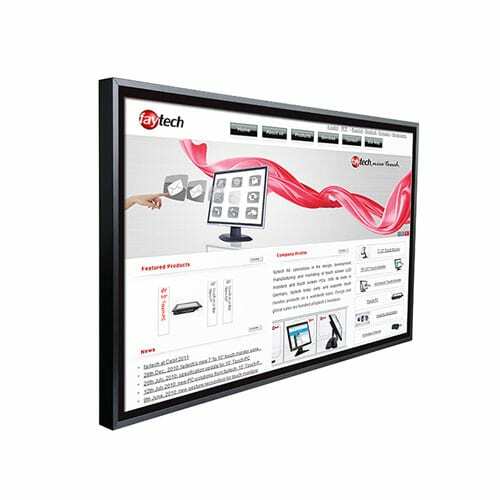 A touch screen monitor is made of insulating material covered with transparent conductors. The most common material used as an insulator is glass. As a transparent conductor, indium tin oxide is usually used. Touching the surface display creates a distortion in the electrostatic field of the screen, as the human body also conducts electricity. The resulted electric distortion is measured as a change in capacitance. In order to identify the touch display’s locations in a way can be used in various technologies, the location is then sent for processing to the controller. The difference from a resistive touch screen, is that users cannot work with a capacitive touchscreen through gloves and other types of electrically insulating material. In consumer electronics, this is a disadvantage because these smartphone and touch tablet PCs cannot be used in cold weather. However, this disadvantage can be overcome with a special-application glove or a special stylus. The top manufacturers of capacitance displays continue to develop more accurate and thinner touch screens. For instance, by building the capacitors inside the display itself, mobile devices such as Samsung’s Super AMOLED screens are being produced now with “in-cell” technology that eliminates a layer. This reduces the visible distance between what the user is touching on the screen and the user’s finger, enabling gestures and taps to be more responsive and creating a more direct contact with the content displayed. There are two main types of capacitance screens: projected and surface. Touch screens based on projected technology deliver interactive solutions for various applications and industries including aerospace, medical, military, and industrial. Multi-touch projected technology has changed forever the way we interact with machines since the iPhone exploded on the market in the year 2007. Touch monitors with projected technology offer many substrate choices and stack-up options, delivering unmatched durability and outstanding optics. The more common approach is based now on mutual capacitance. If they are placed close together, the majority of objects with conductive proprieties can hold a charge. When another conductive object bridges the gap (a finger, for example), the interrupted charge field is being detected by the micro-controller. Surface technology offers environmental robustness and increased durability. These monitors are proven to meet the harsh demands found in vandal prone access sectors, and areas with high traffic. Curved and flat surface touch screens are suitable for graphic driven applications, such as vending machines, entertaining, gaming, banking, and ATMs. It comes with a conductive coating on top of the front surface. The conductive coating features wires connected to each corner. To each of these four corners is applied a small voltage. The operation is based on surface technology relies on the capacitance of the human body. A small current flows to the point when you touch the screen, causing a voltage drop that is then sensed at corners. This screen surface technology can be used easily on a larger size (over 12 inches) applications. Because the structure is only one glass layer, they provide high light transmission (in the range of 88 to 92 percent) and excellent optical clarity. Of all the available technologies, it has the fastest touch response time. These monitors can also withstand regular cleaning using harsh chemicals. How will touchscreen interface technology change your business? Because the touch screen display is based on a durable technology, they can be employed in applications that require increased durability. Among their areas of application are included point-of-sale systems, kiosks, and industrial computer machinery. Another advantage is that they have a higher clarity than resistive-type (higher by 88-92 percent). They also provide you a greater endurance than a resistive type (up to 225 million touches. Interface: Your computer should communicate with the touch screen panels. The most common interface types USB and RS-232. The need for drivers has been eliminated by new HID-compliant touchscreen displays. Mounting: Among the various mounting options are included free-standing, rack mount, and panel mount. In case that you want to use free-standing, make sure that you use a heavy-duty stand that was specifically designed for touch. Environment: For use in a variety of environments, the monitors are available in stainless, standard, and waterproof enclosures. Screen size: Sized from 3.5″ to 52″ size are available. They provide 4:3 or 16:9 aspect ratio. Your decision to select a certain type of display will be based on various factors, including where it will be mounted, the intended users, type of data to be displayed (text, graphics, video), and the operating environment. They can be a great addition to your business if chosen correctly. 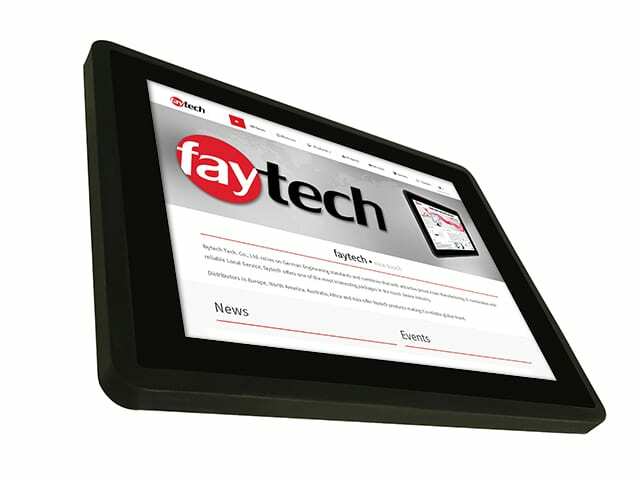 faytech North America’s capacitive touch screen monitor solutions will enhance an organization’s productivity. 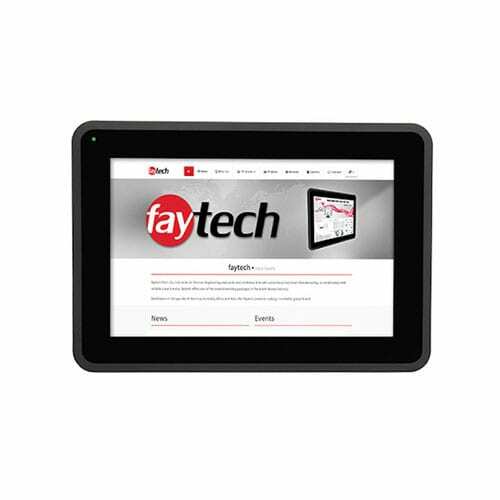 Contact us today to speak with our capacitive touch screen monitor specialists.